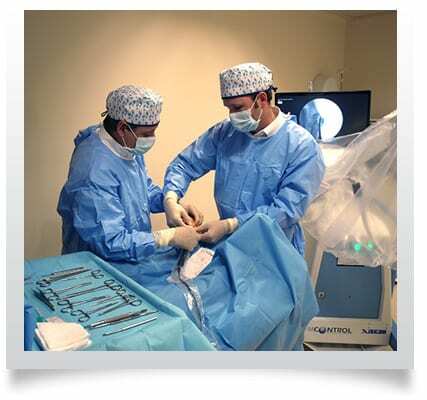 At Clínica San Román we perform advanced percutaneous or minimally invasive surgery techniques. Visit Clínica Médico-Podológica San Román for more information. A Bunion or Hallux Valgus is the deviation of the first toe of the foot towards the second, together with the protrusion (exostosis) of the metatarsophalangeal joint of the first toe. This bone deformity of the bunion causes pain and inflammation. The pain caused by the growth of the bone occurs due to the irritation of a vasculonervous complex covering the side area of the big toe, as well as due to the structural and mechanical alteration involved in the deviation of the bones. Taking into account that a bunion will cause the dislocation of the joint of the first toe, early treatment is recommended to treat it on time since this dislocation does not have an effective treatment. The deformity of the bunion is also generally accompanied by foot disorders of another type notably claw or hammer toes. Bunions mainly occur due to a hereditary defect in the mechanical structure of the foot. Likewise, certain foot types are more prone to developing bunions. We should also emphasise that the use of footwear pressing the toes in an unusual and prolonged manner can contribute to increasing this deformity. A recent study in the USA has demonstrated that 88% of the women wear shoes that are too small and 55%suffer from bunions. This is proven by the fact that bunions are nine times more common in women. The best treatment for bunions is preventive treatment, i.e., preventing its development by means of suitable footwear that does not press the foot or even custom-made plantar orthoses where accompanied by a structural foot disorder such as flat or valgus feet, among others. Surgical intervention will be the treatment of choice when the deformity is evident or the pain prevents a normal life. The aim of the surgical treatment will be the removal of the bone exostosis and the realignment of deviated bone segments for the purpose of preventing the deformity from reappearing. As soon as you observe the appearance of bunions, it is important to visit a foot specialist. Remember that once the bunion occurs, the only treatment for removing the pain and the deformity is surgery. Without treatment, this deformity will without a doubt progress and cause greater discomfort. The medical-podiatric personnel of Clínica San Román examine the degree of deformity, based on studies by imaging, age and level of physical activity of the patient, among others. All this serves to offer an optimal and personalized solution for each patient. At Clínica San Román, we have been using minimal incision or percutaneous techniques, formerly known as “laser” techniques, for the treatment of bunions and other foot deformities for 30 years. The technique that we use is completely ambulatory using local anesthesia. We treat a bunion problem by means of an incision of a few milimetres, respecting the foot joints and without the need for screws or plasters. This allows our patients to LEAVE BY WALKING ON THEIR OWN FEET without any type of help and thus carry on with their life as usual, with hardly any postoperative pain or scars and, what is more important, with a quick recovery and excellent long-term results. Finally we should emphasise, the importance of the experience and professionalism of the surgeon in whom you place your trust , as well as the high aseptic environment of the centre, modern apparatus and instrumentation offer the maximum guarantee of safety for performing surgery. It is important to be aware of the fact that we must care for our feet, not only for aesthetic purposes, but principally for HEALTH, since our feet support our body throughout our lives, and their function is essential for our daily life.